That, ladies and gentlemen, was the old America. In the New America, we apparently know better. Our culture transformers are eagerly remaking Thanksgiving in their own image. This is especially true on the education front. 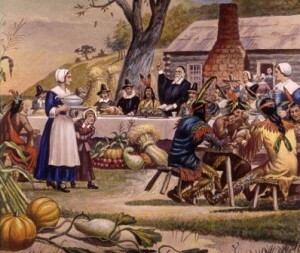 “Thanksgiving Day” is one of three books recommended in the lesson: “Thanksgiving Day” by Anne Rockwell, “Thanksgiving Is …” by Gail Gibbons, and “The Very First Thanksgiving Day” by Rhonda Greene. I do not own these books. I went to their Amazon.com pages to read the descriptions. There is no mention of God, though there are bountiful references to Native Americans, various tribes, corn, stuffing, and turkeys. The Creator even gets trumped by cranberry sauce. Indeed, if you’re on the “politically correct side” of the New America, this is perfect—a book that comprehensively airbrushes God from the historical picture. I ask my secular-liberal friends: Is it any wonder why so many people are homeschooling their kids? Think about it. You can dislike religion, if you prefer. You can even despise it. But a truly “inclusive” education cannot exclude such essential historical facts. This is historical fraud, forgery, perjury. I’m reminded of a conversation I recently had with a friend who works in the children’s section at Barnes & Noble. She regularly briefs me on the latest political correctness and rank secularism pervading today’s books offered by “educators.” She was cataloguing the stock of Thanksgiving books. “You don’t want to know,” she groaned. She found only one book in which thanks was given to God. “’Thankful’ for what?” I replied. Well, that isn’t Thanksgiving. It never was. Welcome, pilgrim, to the new world.